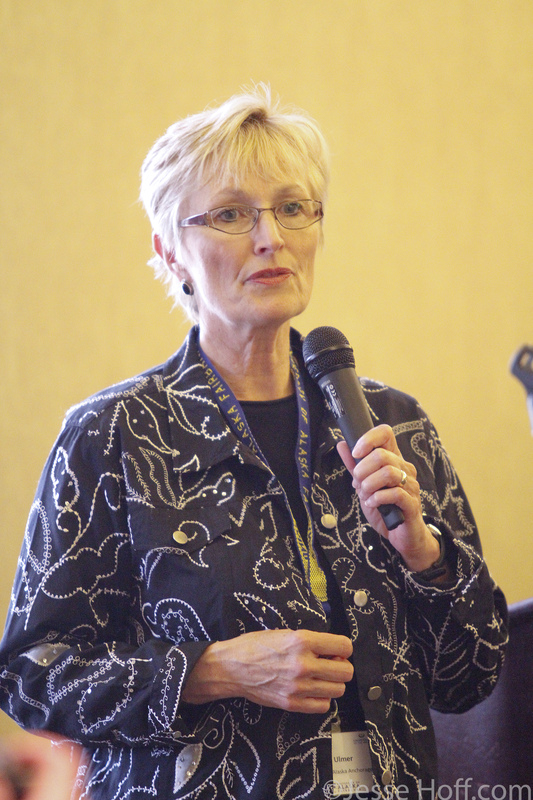 Fran Ulmer, UAA chancellor, speaks at the Princess Lodge on Thursday night. Photo by Jesse Hoff. While the main attraction at last Thursday’s oil spill listening session was the attendance of retiring UAA Chancellor Fran Ulmer, I found that the most interesting aspect of the evening was simply listening to and watching the four member science panel talk about, well, science. Well, when a topic becomes popular enough (for instance, “Global Warming”) certain buzz-words or buzz-phrases begin to enter into our collective dictionary. The Deepwater Horizon Oil Spill itself has given rise to several buzzwords and colloquial sayings such as “the disaster in the Gulf”, the “Gulf oil spill”, “BP”, “tar balls”, “cap”, “blow-out” and several others, I am sure. The Deepwater spill has had such an impact on our nations psyche that even at our own Red Green Regatta there were at least two crafts there that shared the spill as their theme. But what does this have to do with the listening session? To put it blatantly (and rather clichéd): Everything. At the session, scientists were there to tell Fran Ulmer, one of seven members of the recently established (and awkwardly titled) National Commission on the Deepwater Horizon Oil Spill and Offshore Drilling, just what she needed to know. They refrained from an emotional outpouring and did so without the use of buzzwords. In fact, three out of the four scientists on the panel seemed to have been more concerned about letting Ulmer know the importance of the sciences themselves, and in scientific research, then in discussing the oil spill. At least, as it seemed to me, they seemed more interested in the spill as a research opportunity then as a “disaster.” And to be honest, why not make the best out of a bad situation? Mike Castellini, the Interim Dean of the UAF School of Fisheries and Ocean Sciences, felt that what Ulmer’s commission should do is gather information to prevent a spill of the Gulf’s magnitude from happening again. According to Castellini, “having (scientific) information ahead of time is just as important as having it after the fact,” he said, arguing for the importance of oceanographic studies in cleaning up the Deepwater spill. “It’s very hard to describe the after if you don’t know what the before was like,” said the man with the dolphin belt buckle (he was totally wearing one which was super cool). David Christie, the Director of the Alaska Sea Grant College Program, also agreed with Castellini. He was sporting a fantastic necktie with a geographical map of Australia emblazoned across it. Finally, I noted, scientists with a sense of style. Tom Weingartner, a professor of Physical Oceanography at UAF and the recent winner of the 2010 Emil Usibelli Distinguished Research Award, stressed that the study of ocean currents remains critical in oil cleanups. During the Exxon Valdez Oil Spill (EVOS) scientists (Weingartner among them) realized that much of the oil spilled eventually settled to the bottom of the sea floor, with the implication that the same will happen in the gulf.